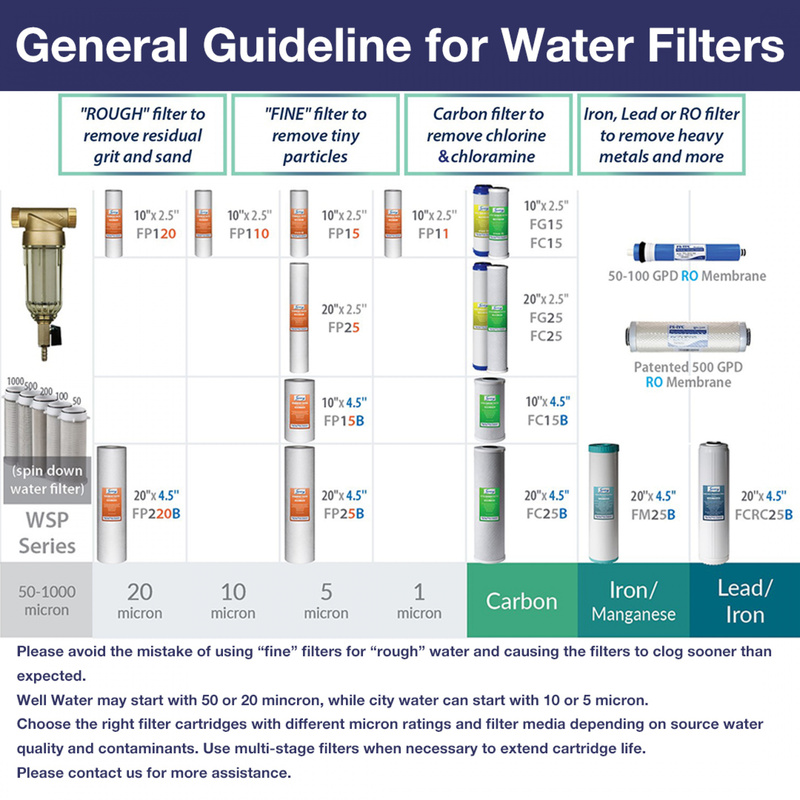 Equipped with gradient three stage filtration, iSpring WGB32BM whole house water system removes sediment, chlorine, Iron, Manganese, rust, pesticides, herbicides, industrial solvents, VOCs, and various other contaminants. 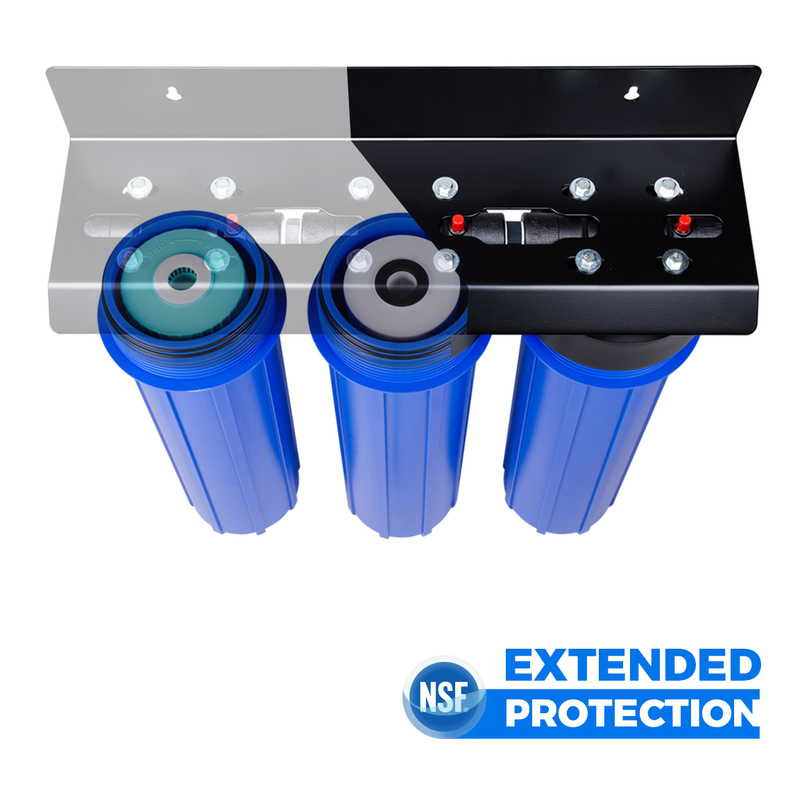 With 1 inch NPT inlet/ outlet, it has minimum impact on water flow (up to 15 GPM) and requires minimum maintenance. 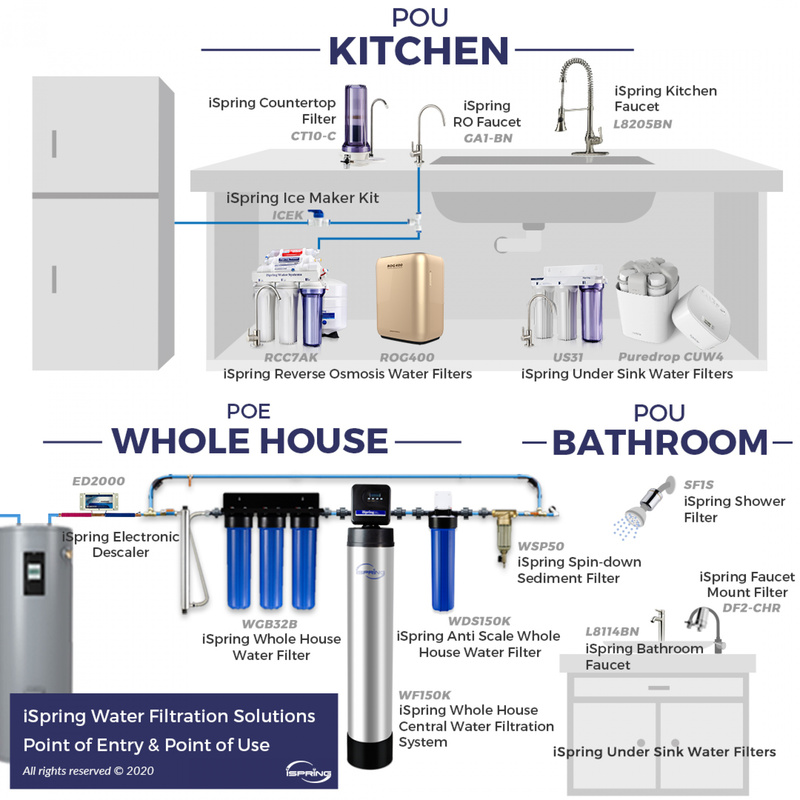 Installed at the main water supply to treat all the water you use in your entire home. 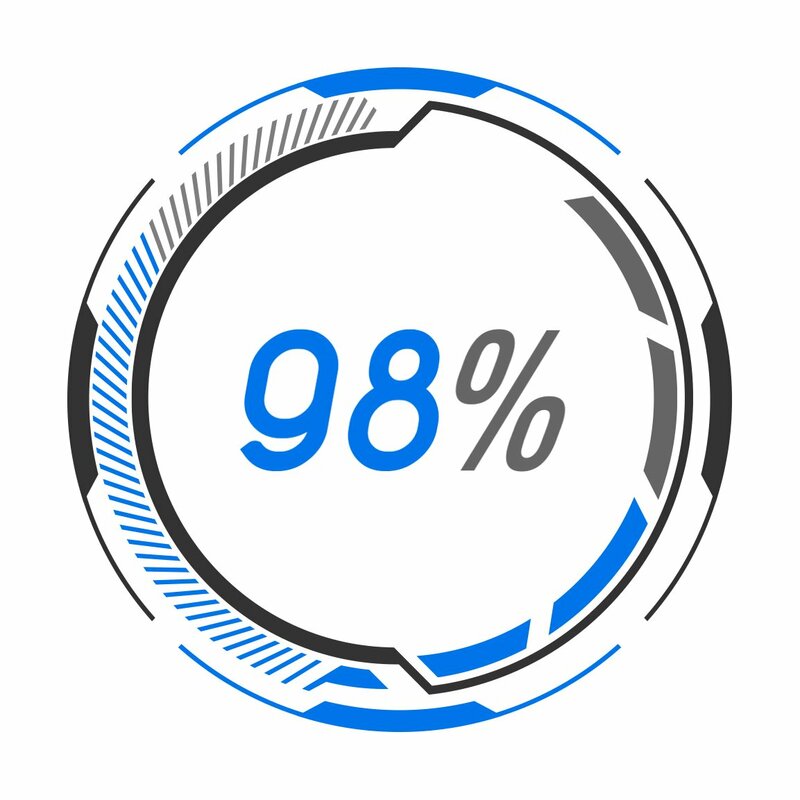 Enjoy better water from every tap and every appliance in the whole house. 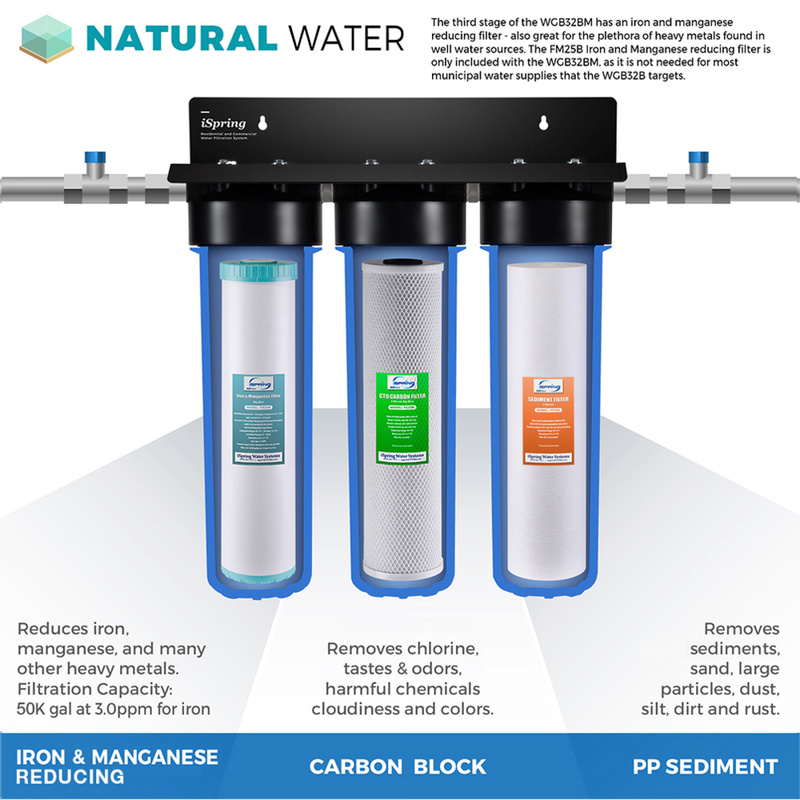 In addition to the basic features of sediment, chlorine and odor removal, this system also excels in the reduction of iron and manganese residue to protect your home appliances, such as the dishwasher and washing machine. 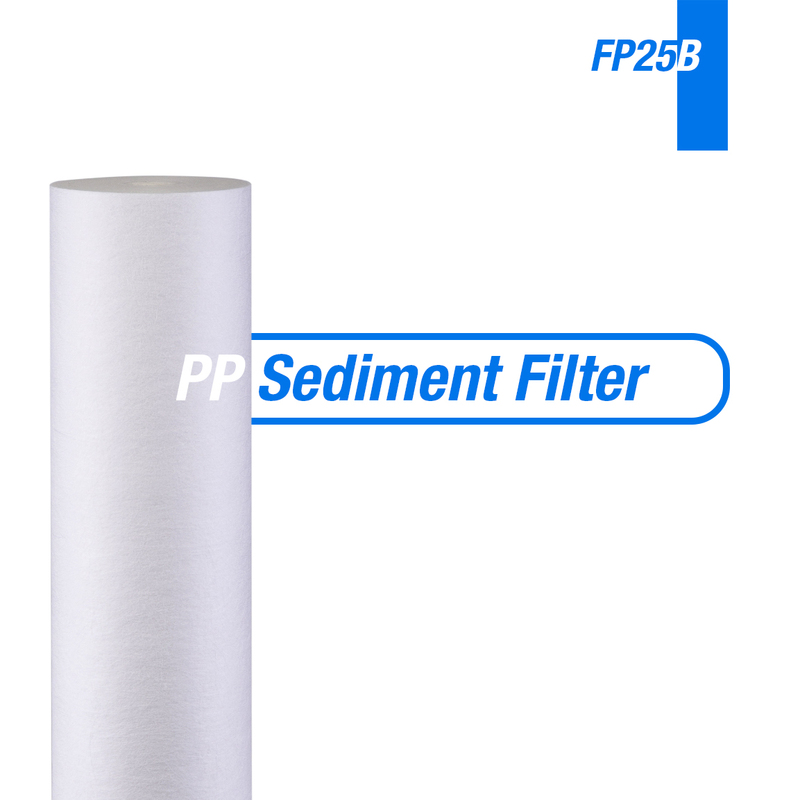 The first stage high capacity polypropylene sediment filter achieves filtration down to 5 microns. 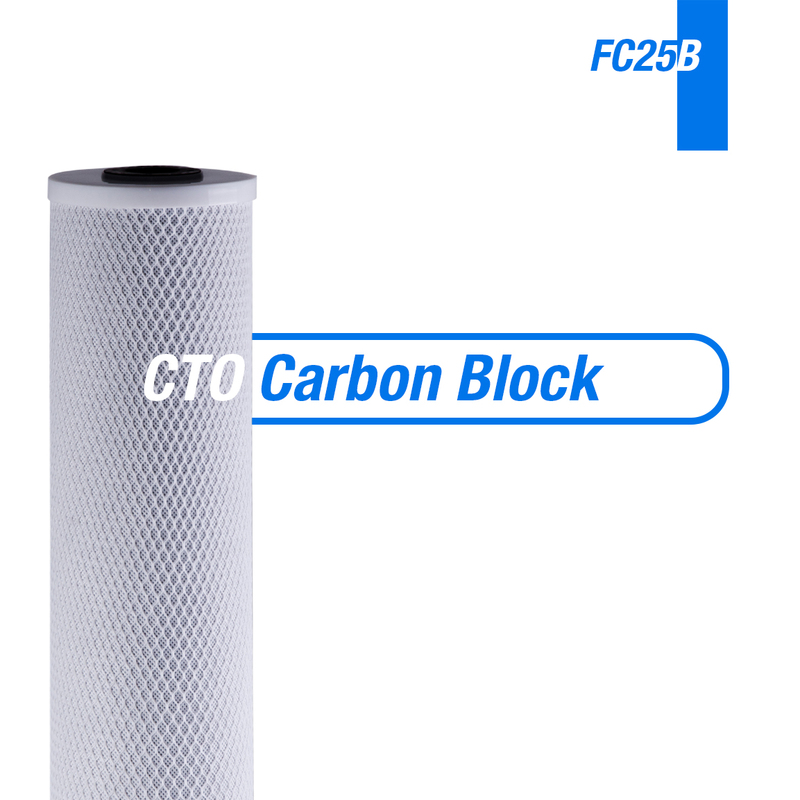 The second stage CTO Carbon Block filter uses high quality coconut shell carbon for maximum filtration efficiency and filter life. 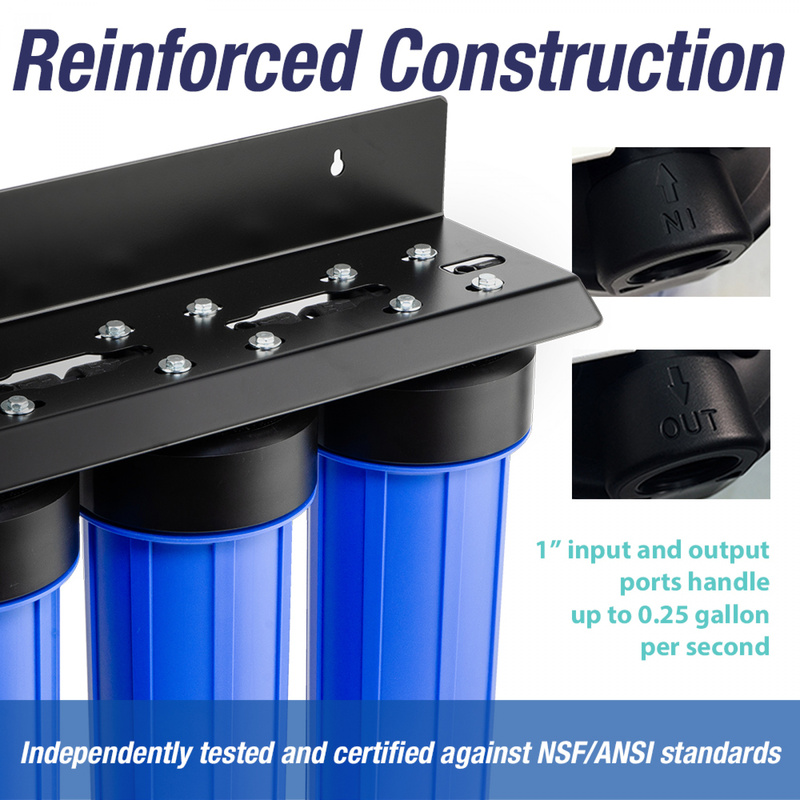 Both are tested by independent third-party to meet NSF/ANSI Standards. 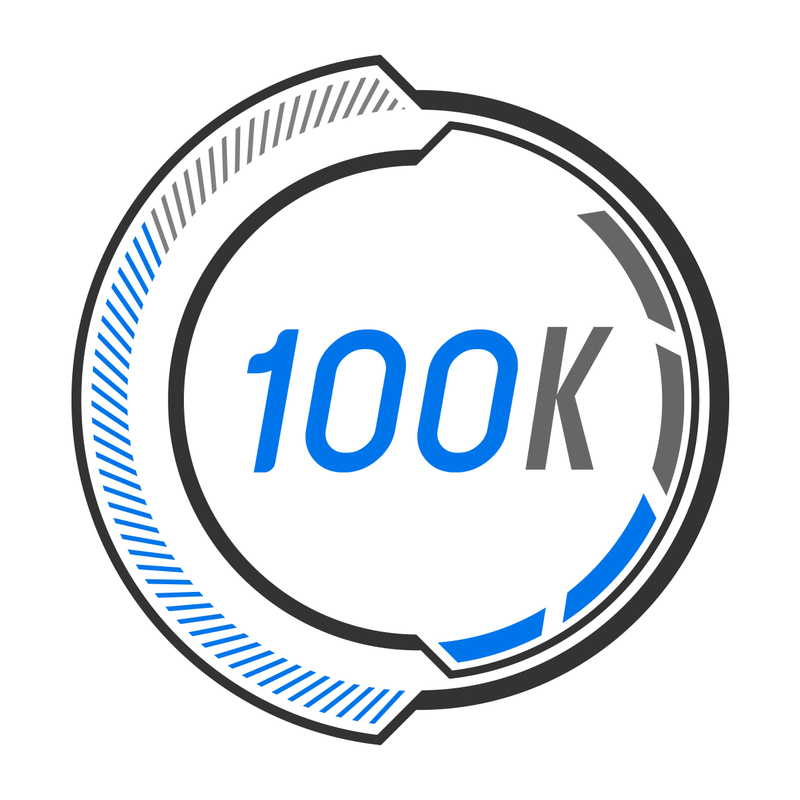 Both filters have a capacity of 100,000 gallon of water to supply one full year of clean water for a family of four. 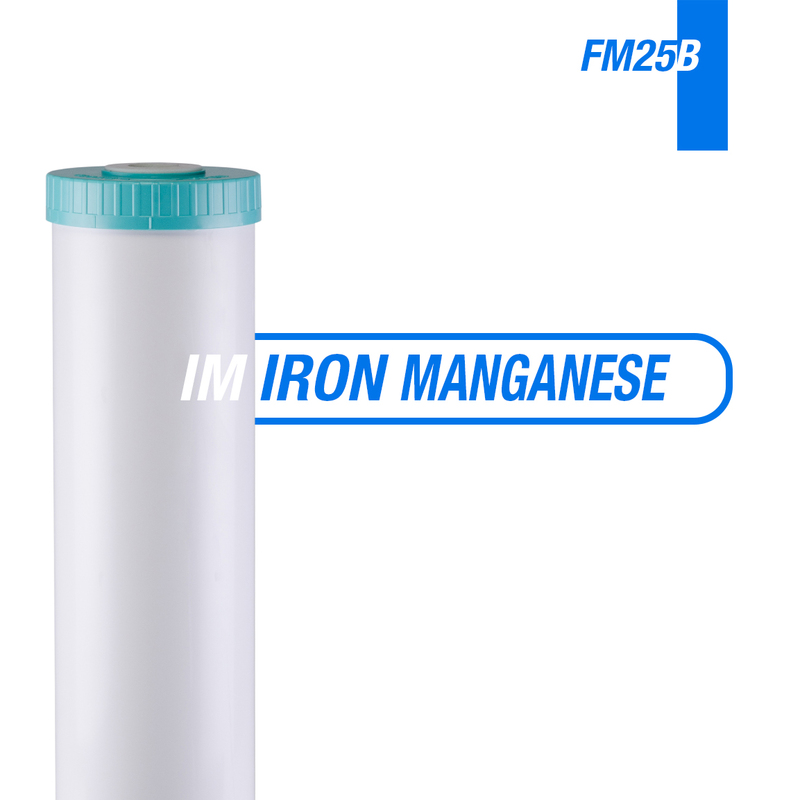 The last stage FM25B iron and manganese removal filter efficiently reduces iron (3.0 -> 0.01 ppm) and manganese (1.0 -> 0.01 ppm), and lasts up to 3 times longer than greensand because the catalytic media is not being consumed in the process.